We have to do what we need to do when we need to do it. We have to work extra hard to do what we want to do. What we want to do usually comes and goes so quickly it's almost like a beautiful dream. In order to continue to smile, we have to hold onto that dream so tightly until it finally feels like it is a part of our reality. Lifetime premiered a movie, The Trip To Bountiful, over the weekend. 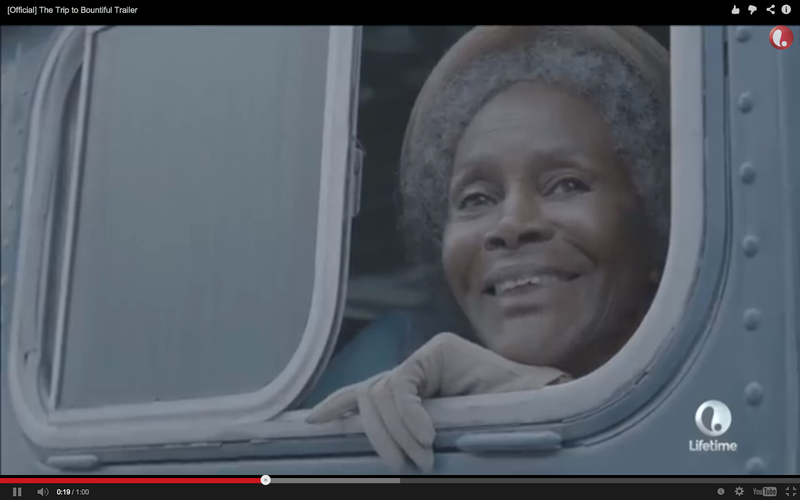 The movie featured everyone's favorite wise woman, Cicely Tyson. Tyson's character Carrie Watts was an unhappy old woman who was stuck living with her son and daughter-in-law. She treated her as if she was a child and gave her no room to be happy. All she wanted was to feel some joy again. That joy was in her old hometown, Bountiful. The meaning of bountiful is an abundance. The problem is no one else wants her to go. After a while of being unemployed, her son is finally working full time and even trying to figure out how to ask for a raise. Her daughter-in-law, Jessie Mae, is just annoyed by everything she does. Jessie Mae hates the hymns, hates having to look after her, and hates the thought of this place called Bountiful. However, Carrie is determined to feel some happiness in her heart again and she runs off to get that happiness. As Carrie boarded a bus, she looked forward to everything Bountiful had to offer. Her best friend since childhood was still there. Her happy memories were there. Her old house was still there. The beauty of the countryside was there. She was so excited she spoke with everyone she came in contact with about Bountiful. First Carrie met a young woman on the bus who was traveling to see her family. Then Carrie shared her tale of traveling back to her home with the man at the bus station. This is when she found out her long term best friend had passed away. That friend was the last living person in the town. This made her angry and determined to get to Bountiful even more. Have you ever had that one place in mind where you want to live out the rest of your days? At some point in the movie, Carrie decided she wanted to see Bountiful so bad she was willing to die to get there. I actually thought this was where the plot was going, because there were so many obstacles. The son and daughter-in-law informed the police to pick Carrie up from the bus station. The bus station guy tried to hold her from carrying out her mission and so did this policeman. The policeman had a heart and finally gave in. The minute Carrie makes it to Bountiful is the best part of the movie. She's happy again and looks youthful. The memories are flooding back. There is peace surrounding her. She knows her son will soon be there to get her, so she takes it all in. In fact when he arrives, she tries to get him to enjoy the beauty as well. The son didn't really want to remember the beauty of Bountiful. He didn't want to her stories of his childhood there and his wife didn't appreciate the place either. Have you ever had the special moment in life where everything just went right for you? You got the job, or the significant other, or the trip to that dream place you've always wanted to visit. You wanted your close friends/family to share in the joy, but they ruined it by not caring. Yeah, no one else wanted to be in Bountiful. The movie ends with Carrie and her family heading back to Houston. It's ironic that Houston is the city they lived in. She was sad because she was once again leaving a place that brought her joy, but she smiled because she was holding onto the memory of being there once again. I think that's the difference between true happiness and settling. When you're truly happy, every experience becomes that special memory to hold onto. When you settle, you hold onto those moments that did you make you happy so you can continue to have a reason to smile. very nice article, i might see this soon.